My passion for bones was rekindled during a wedding anniversary dinner several years ago in a well-known Paris restaurant. The evening began tentatively, with my furtive glances at the man seated at the next table. No, I wasn't plotting a change of mate, I was envious. Envious of this stranger's bones: a plate of three towering marrow bones, each topped with a different topping. I wanted those bones. More and more I find myself seeking the skills of the past, amid the yellowing and ancient volumes of my vast library. A modern life of instant pizza and frozen toast is weak and unsatisfying; I seek the knowledge of chefs past, unafraid to wrestle with the very elements of nature herself in order to coax gustatory delights from them. 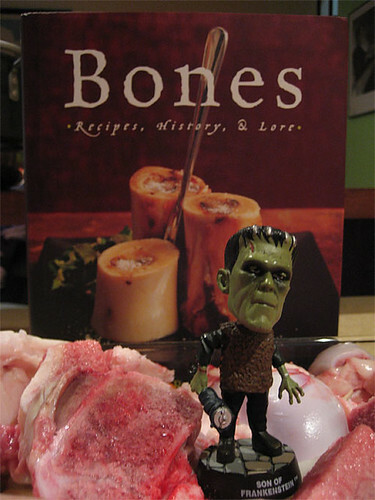 When I heard that there was a cookbook called Bones, I was both amused and faintly shocked-- who in our sensitive age wanted to be reminded that our kitchens are in fact charnel houses, graveyards, crematoria? Yet as I sat in my bed chamber brooding upon the thought, night after night, I came in time to see how natural, how perfect, how captivating the very thought was. It was as if a voice was inside my head, telling me that it was time to throw off the shroud of delicacy, of euphemism and suppressed knowledge, and revel in the acceptance of Death as our constant companion, indeed, our truest friend. To sup at his table, laugh at his one joke, and know that as much as men fear Death, there is something else-- oh, how I of all men know there is something else-- more fearsome yet, from which Death would be the kindliest of mercies. And so I set out to recover for myself the ancient arts which once made life from Death's own handiwork; and learn the skills of cooking from bones. My ultimate meal would be braised short-ribs, a recipe taken from the Balthazar cookbook (where, interestingly, it is said to be the first thing taught to new cooks); but before I could embark upon it, I had to make the veal stock that would be one of its most essential constituents, and for that I turned to the instructions within the yellowing, decaying pages of Bones. 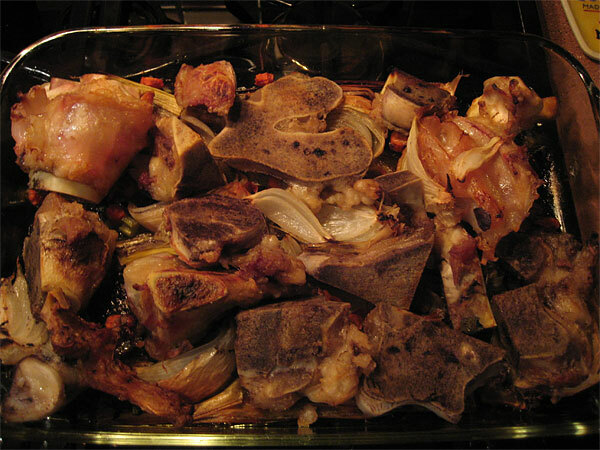 The first step was acquiring, through contacts in the flesh-trade, a sufficient quantity of veal bones, and reducing them to sizes adequate for cooking. Fortunately my assistant was extremely capable at rending creatures limb from limb, and he made short work of reducing the luckless beast to a bloody mass of bones and marrow. Jennifer McLagan wrote: Bones connect me to my childhood, and they link all of us to our past. As I researched this book, I discovered that bones have played an essential role in the history of mankind. They were practical, providing the material for tools. They were powerful, enabling people to foretell the future and ward off evil. They were decorative, fashioned into beautiful objects and jewelry. 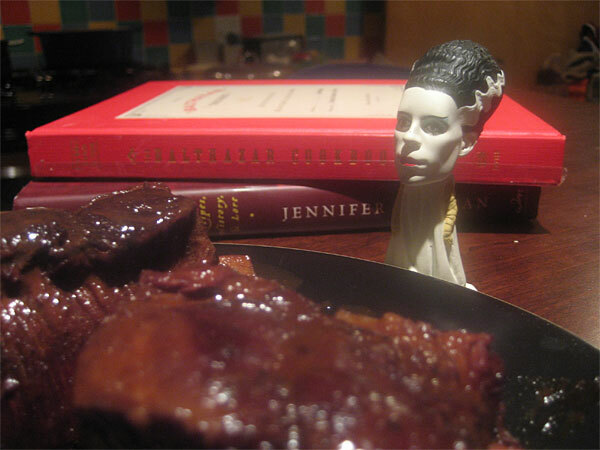 Of course, the past is not always an unalloyed joy to be linked to; sometimes a memory (oh, dear Lenore!) is so hideous that it is all one can do to blot it out during the day, but always, night comes, and with it-- but enough! 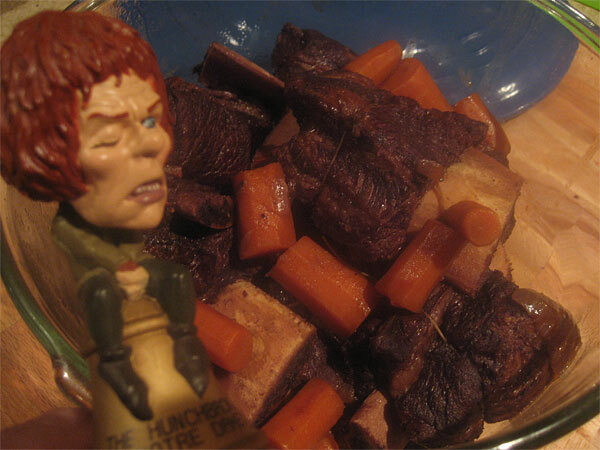 Having browned them in the oven over vegetables, the aesthetic aspect of bones soon revealed itself to me-- what colors! What composition! Is it not worthy of a Raphael or a Tintoretto, this array of bones in all its magnificent coloration of decline and extinction? Do they not seem peaceful, at rest in the very sort of rest denied to me-- denied, most cruelly, to my beloved Lenore? 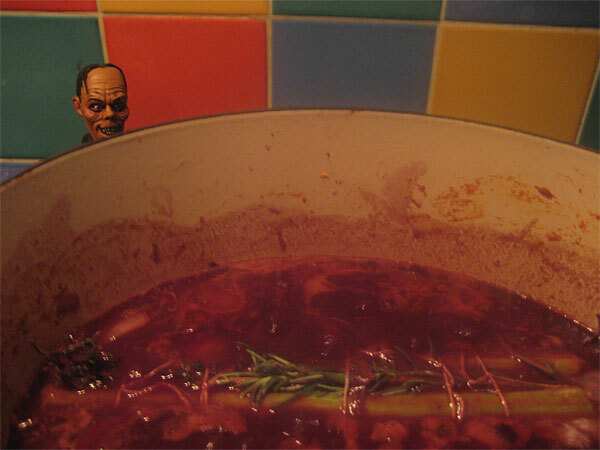 Place the bones and vegetables in a pot and cover with water, then simmer for hours, uncovered-- as I should have uncovered you, Lenore, instead of listening to them when they said you had been pronounced dead by a competent surgeon, and that I merely imagined the sound of you scratching, scratching at the lid of your tomb! Placed there by my own hand, to beat against that lid and call for me helplessly, hopelessly, until-- too late! After six hours, strain the stock, a thick brown gelatinous stock. It is simplicity itself, as long as one does not burn it, there is little else to do but let it cook itself down. Skim off fat, cool it overnight to separate more; I used about half of it in my subsequent recipe and froze the rest in small jars for future use. It is a skill I was instantly grateful to have acquired; I shall not fear bones in the future, but revel in them. The next time I need their rich flavor, I shall simply dig up one of my entombed jars of stock and restore it to life, as-- the thought occurred to me-- could I not do, as well, for my beloved Lenore? 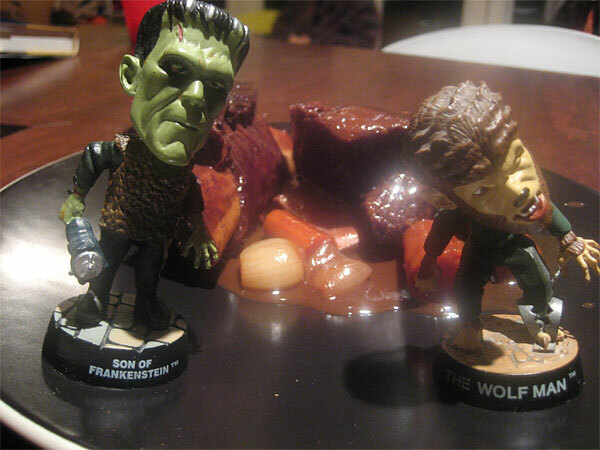 And so on to my main recipe, braised short ribs in a wine-flavored stock. 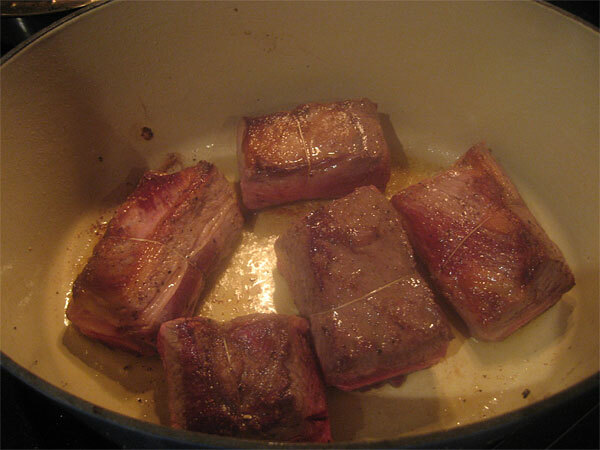 First bind the short ribs tightly, then (as if dropping a parcel into the inky depths of the river) drop them into the pan to brown them. Next, wine, a very fine Amontillado from my cellar recommended by my friend Montresor, the veal stock, and vegetables, all covering the short ribs. In this rich blood-red stew life seems to return to the very tissue, what was once thought dead and lost to me forever is reanimated with the spark of life. Oh, Lenore! Can it be true that in this way I have atoned, atoned for the dreadful crime of committing your still-living body to the grave prematurely? Last edited by Mike G on October 31st, 2006, 11:12 am, edited 1 time in total. Edgar Allan Gebert, a delightful post, instructive and inspiring. Too often we cast off the remains of a carcass that could serve us well. Mike G, this post was as good as finding the one house on the block that slipped a full size candy bar into your plastic trick-or-treat pumpkin bucket! I may just print out copies of your post to hand out for Trick or Treat tonight. Snicker's for the kids, copy of Dead Bones for the parents. Did you make the veal stock, or buy it? If the latter, from where? The first part (above the asterisks) WAS the making of the veal stock. Mike G wrote: The first part (above the asterisks) WAS the making of the veal stock. Yeah, I'm an idiot. So how about this... where are the bones from, aside from just a contact in the flesh trade. The bones were from ever-trusty Paulina, where they cost a pretty $3-something a pound, which makes the actual meat and marrow on them as expensive as caviar. 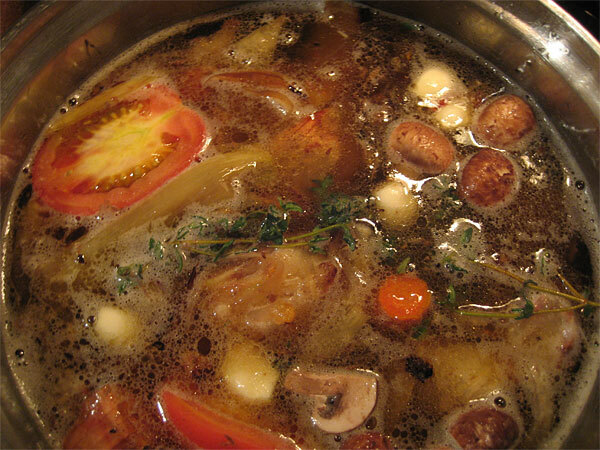 When I thought I was only going to get enough stock to use in this one dish, which would (with vegetables and so on) make veal stock roughly a $20 ingredient, I was pretty sure that this was one sucker mistake I was not going to make again. When I actually got to the finish, and realized how powerfully concentrated with flavor and velvet gelatinous silkiness the stock was, and that I would only need about two cups of this Superstock in my dish-- call it about $8 worth-- I mellowed considerably on the subject of veal stock. Indeed, it was surely worth a couple of bucks just to have permeated the house with such a rich, homey, autumnal Grandma-making-potroast smell. For the first time, perhaps, I truly understood these words of Evil Ronnie's; I would make veal stock just for the pleasure of it every day, well, once a week anyway. It is the truffle to chicken stock's shiitake, a magic ingredient of instant transcendance. So it is now in my repertoire, though if I can find a place to get those pricey bones cheaper, I will. Thanks for another teriffic post and also for the reminder of that soup thread! I just wanted to add a few comments. 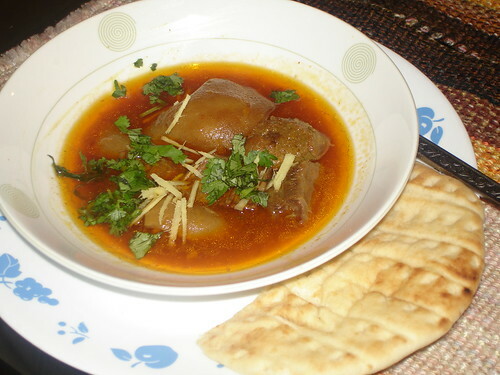 As you've indicated, veal stock is not only a time consuming and laborious process, but also an expensive one. For home use, I keep CulinArte's glace de veau (available at Paulina) in the freezer, but I wanted to bring up the French technique of making a "remoulage" or second washing of the bones. This is where, after all of the simmering, skimming and straining, you cover the bones with water for a second go 'round and simmer again for an additional 4-6 hours. This process yield a very servicable and amazingly, highly gelatinized "second stock", or remoulage, slightly weaker in both flavor and color, but a beautiful tool for say, a braise, or a French onion soup, or best of all, to put over fresh bones for your "first run", giving you an even richer, silkier stock than with water. Also, after you've experimented a bit, and tweaked the recipe and process to your liking, just for fun, try making your veal stock using chicken stock to cover the bones rather than water. Again, thanks for a super post and Happy Halloween! Evil Ronnie wrote: a "remoulage" or second washing of the bones. This is where, after all of the simmering, skimming and straining, you cover the bones with water for a second go 'round and simmer again for an additional 4-6 hours. This process yield a very servicable and amazingly, highly gelatinized "second stock", or remoulage, slightly weaker in both flavor and color, but a beautiful tool for say, a braise, or a French onion soup, or best of all, to put over fresh bones for your "first run", giving you an even richer, silkier stock than with water. You know, I almost gave that a shot-- the book doesn't say anything about it but I just looked at the bones and thought, hey, I bet there's still plenty there-- but it would have meant being up with it until late hours, so I let it go. Definitely makes sense, though, the bones did not look played out. I actually looked for veal glace at Paulina, but I'm glad I didn't find it as I'd never have made the stock if I had. Which would have been a real shame; I'm really glad I went to the effort and the end result was mine, all mine. Maybe it is not the safest thing to do, especially since I live with a curious cat, I have left a stock pot simmer overnight. Alternately, you could also simmer in a crockpot overnight. BTW - how do you know you sent Lenore to her grave alive? I really hope you are dead wrong because the alternative just feeds my nightmares. Cathy2 wrote: Alternately, you could also simmer in a crockpot overnight. I did just that with a leftover turkey carcass for Halloween - by the time Sparky and the 'spouse were home from candy patrol, spectacular turkey soup...I agree, boneless isn't as good as bone-in, regardless of the convenience gained. Loved the post, Mike. Particularly so because I'd only recently come to know how a stock could actually be so "velvety" and "gelatinized." My lessons in home-cooking with my mother brought out the veal bones frequently, and I finally figured out where all that richness came from in those dishes. It's perhaps a dirtier end-product since we don't serially clean & concentrate, but still rich & tasty nonetheless. 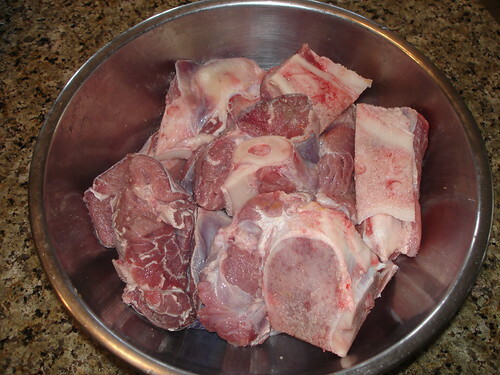 I recall making paya, where half the battle was (won) in drawing out marrow from the bones. Oh yeah, one key step I forgot was taking sips of the nectar at various stages of the game. Along similar lines, the picture of dicksond drinking a cup of IB gravy from the Beefathon brought a huge smile to my face. I was in Garden Fresh Market in Northbrook this morning. They had veal shank bones for stock at 99 cents per pound. If this were a cooler day, then I would have bought them for immediate stock production. A few weeks back I made a roasted marrow bone dinner for myself. It was my first time doing something like this and I enjoyed all the beefy flavor. Couldn't get the wife to try it though. I will be making them again someday, and I have a bag of bones left in the freezer for making some soup or stock this fall. I've seen them at Caputo's on Harlem. I'd call and check at Ed & Irv's: I know he keeps various kinds of frozen soup bones, but am not sure about veal. Marketplace on Oakton has had them for less than $3/lb in the past, but not sure how much less. I haven't bought any since last winter. I recall finding surprisingly cheap ones ($1-1.50/lb) at Treasure Island of all places. I used to live near the one on Broadway in Lakeview. The only problem was that they only ever had a couple sitting out and the butcher was always out if I asked for more. So, I'd buy what they had and toss them into the freezer, repeating that process until I had enough to be worth the time to make stock. I started a new job last month and it feels great to be cooking again. Mirepoix is browned and deglazed with wine before being added to pot. Everything is then covered with 12 Gal chicken stock (not water). 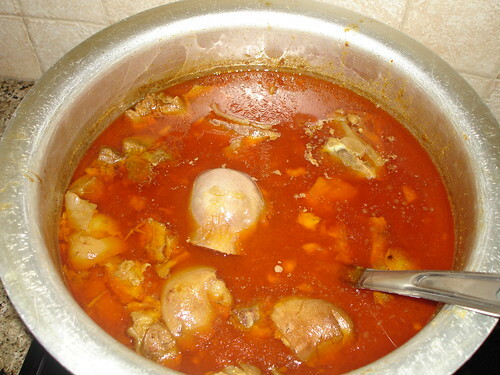 Simmer for at least 12 hours, skimming constantly and strain. 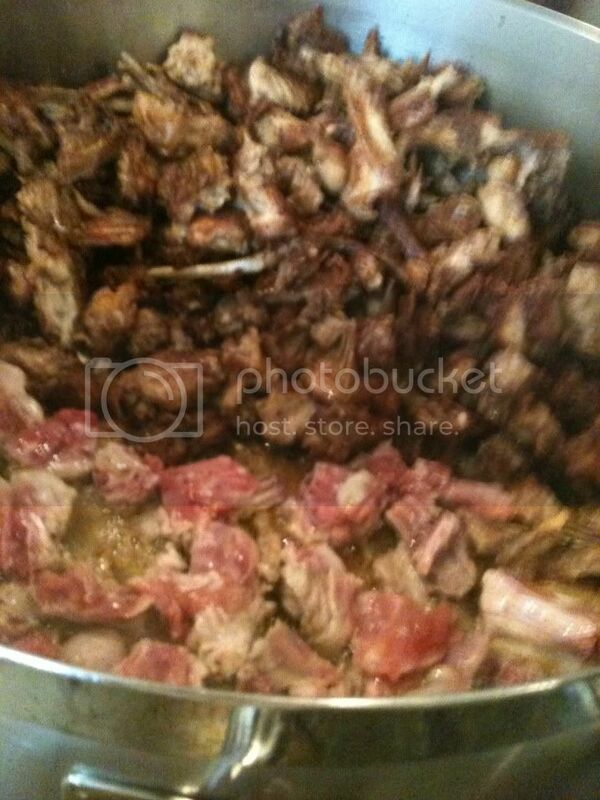 Re cover bones with water and cook out once again for 10-12 hours. Strain. 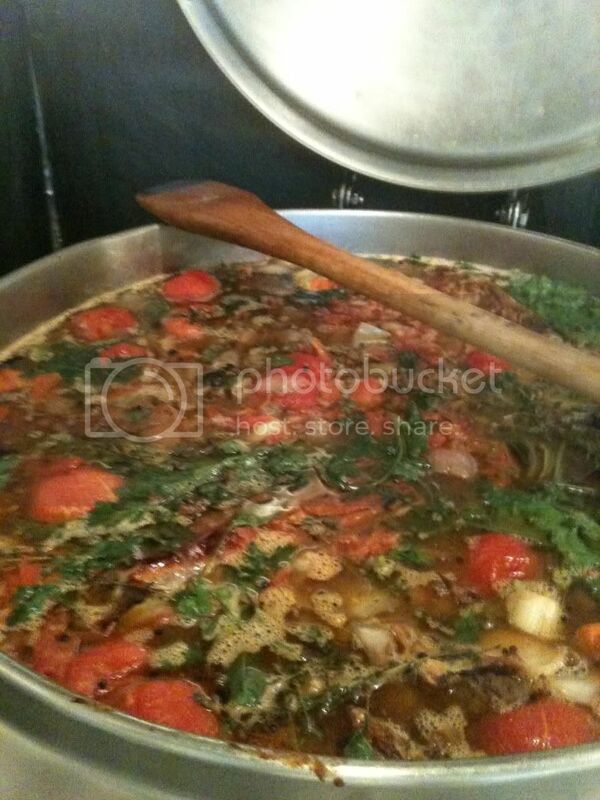 Combine 1st and 2nd stocks and reduce to sauce consistency, skimming constantly. Last edited by Evil Ronnie on September 4th, 2010, 12:09 am, edited 1 time in total. as a glove, and bend over a large blue plastic barrel at the end of the Fresh Meat Counter. Building a nice fond for a brown rabbit stock which will be reduced to a rabbit glaze that we add to rabbit-green peppercorn terrine for flavor enhancement. You are inspiring me to get back into the stock-making business, Evil R. My stocks (so to speak) ran out in the spring but it appears that the weather for such things is upon us, and nothing makes the house feel more comfy on a cold day than to fill it with simmering stock-smells.